Chico Hernandez, back to, competes in October against Ukrainian fighter and silver medalist Volodymyr Ivanenko at the World Masters Sambo Championships in Casablanca, Morroco. WASHBURN, Maine — A trip that began with plenty of negatives ended in triumph for a local wrestler. Sixty-four year-old James “Chico” Hernandez of Washburn, who is the varsity wrestling coach at Caribou High School, traveled to the African city of Casablanca in Morocco to compete in the World Masters Sambo Championships Oct. 20 and 21. 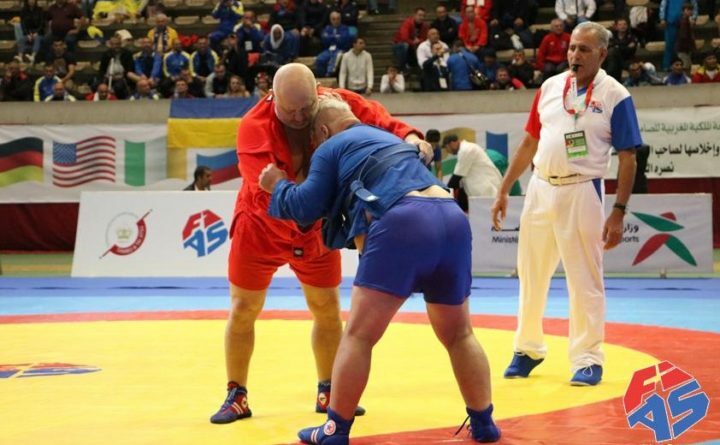 He competed in the 60-64 age division in the 100 kilograms-and-over weight division and came away with a bronze medal, but it did not come easily. The Bangor Daily News is pleased to feature content from our sister website, The County. To read the rest of “Washburn man medals at world wrestling championships,” an article by The County staff writer Kevin Sjoberg, please follow this link to The County online.